In 1997, Jay Bonin won the Manhattan Chess Club championship. 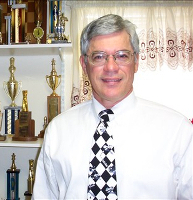 In 1997, Dean Ippolito won the Marshall Chess Club championship. In 1997, Peter Svidler won the Russian championship. In 1997, Army Major David Hater and Dwaine Roberts (Marines Corps) tied for 1st in the 38th annual U.S. Armed Forces Championship. Hater won on tiebreak. The Air Force won the team championship. In January 1997, the top rated players were Kasparov at 2795, Anand at 2765, Karpov at 2760, Kramnik at 2740, and Ivanchuk at 2740. In January 1997, Jennifer Shahade became the youngest female US master at 15 years, 11 months. In January 1997, Nunn, Hebden, and Rozenthalis tied for 1st at Hastings. On February 2, 1997, GM (1952) Erich Eliskases (1913-1997) died in Cordoba, Austria at the age of 83. On February 16, 1997, Alvis Vitolins (1946-1997), Latvian International Master, committed suicide by jumping onto the frozen ice of the Gauja river from a railway bridge. He was only 50. In March 1997, two teenagers got into a fight over a school chess game. 13-year-old John Slack was in critical condition. His 15-year-old opponent was arrested on an assault charge. In March 1997, Luke McShane became an International Master at 13 years, 2 months. On March 22, 1997, US national master Barry Spriro died. In April 1997, Etienne Bacrot became the youngest GM ever up to that time, at the age of 14 years, 2 months. On May 11, 1997, Garry Kasparov lost to Deeper Blue computer (2.5-3.5). This was the first time a computer defeated a reigning world champion in a classical chess match. DEEP BLUE had 30 IBM RS-6000 SP processors coupled to 480 chess chips. It could evaluate 200 million moves per second. Kasparov later claimed that the team of chess players assembled by IBM had intervened in move selections that they were not computer selections because the moves were too human. $700,000 went to the Deep Blue team and $400,000 went to Kasparov. In 1997, the Allen Newell Medal for Research Excellence went to several people involved in computer chess. Ken Thompson and Joe Condon won for their pioneering work on Belle, the first master in 1983. Richard Greenblatt won for having developed MacHack VI in 1967, the first Class C chess computer. Lawrence Atkin and David Slate won for developing CHESS 4.7, the first Class B and first Expert chess computer from 1970 to 1978. Murray Campbell, Carl Ebeling, and Gordon Goetsch won for developing Hitech, the first Senior Master computer in 1988. Hans Berliner won for all his work in computer chess. Feng Hsu won for developing Deep Thought, the first chess computer that performed at a Grandmaster level in 1988. Thomas Anantharaman, Michael Browne, Murray Campbell, and Andreas Nowatzyk won for their work on Deep Thought in 1997. Murray Campbell, A. Joseph Hoane, Jr, and Feng Hsu won for their work on Deep Blue which defeated Garry Kasparov in 1997. In 1997 the $100,000 Fredkin Award went to the inventors of Deep Blue - Feng Hsu, Murray Campbell, and Joseph Hoane, of IBM. Their program defeat Kasparov. In July 1997, chess author Walter Korn died. On July 6, 1997, Alexander Shabalov won the World Open, held in Philadelphia. He scored 8 out of 9. On July 20, 1997, Julian Hodgson won the 1997 Canadian Open, held in Winnipeg. On July 27, 1997, Tal Shaked won the World Junior Chess Championship, held in Zagen, Poland. On July 28, 1997, Vishy Anand won the 30th Biel Chess Festival, a category XVII (2661) tournament. In August 1997, Alexander Yermolinsky won the 98th US Open in Orlando, Florida. On August 15, 1997, Michael Adams and Sadler tied for 1st in the British Championship, held in Hove, England. On August 20, 1997, US master Eugene Shapiro (1929- 1997) died. In September 1997, the highest rated PCA players were: Kasparov — 2827; Kramnik — 2774; Anand — 2765. On September 1, 1997, Esther Epstein won the US Women's Championship. On September 1, 1997, Jay Bonin won the 119th New York State Championship. This is the longest running annual tournament in the world. On September 5, 1997, George Shainswit (1918-1997) died. On September 10, 1997, Jonathan Mestel gained the GM title in Problem Solving. He was the first over-the-board (OTB) grandmaster to do so. On September 12, 1997, Joel Benjamin won the Interplay US Championship, held in Chandler, Arizona. In September 1997, GM Lautier married WGM Almira Skripchenko. In October 1997, IBM announced that they were scrapping Deep Blue. On October 9, 1997, Kasparov, Kramnik, and Svidler tied at the Fontys Tournament, Tilburg, a Category XVII (2667) tournament. On October 20, 1997, Ruslan Ponomarov became the world's youngest grandmaster at 14 years, 1 month. In November 1997, the 8th NATO championship was held in Apt, France. Germany took 1st place, followed by France and Denmark. Hans-Walter Geberl of Germany was the top individual winner. In November 1997, the 33rd American Open, held in Santa Monica, was won by Alex Goldin, Igor Ivanov, and Walter Browne. On November 2, 1997, the 15th world microcomputer chess championship was held in Paris, France. It was won by Junior. On November 21, 1997, Anand and Ivanchuk won the 6th Investbanka Tournament, held in Belgrade. It was a category XVIII (2679) tournament. On November 23, 1997, Janis Klovans (1935- ) of Latvia won the 7th World Senior Chess Championship, held in Germany. He was awarded the GM title at age 62. On December 29, 1997, Galliamova-Ivanchuk won the FIDE Women's Candidates in Groningen. On December 30, 1997, Vishy Anand won the FIDE World Chess Championship knockout in Groningen.